I always think of Morcheeba as a little bit magical. 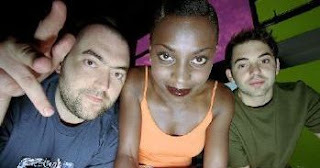 I remember first hearing them and even just hearing the name "Morcheeba." It was like one of those moments in a '60s psychedelic movie where the camera explodes into kaleidoscopic colors and everyone starts staggering around the room and falling over. On a less mystical level, just two producers and a singer, Morcheeba blends the downtempo trip-hop vibe with enough eclectic touches to make them actually interesting. Why I have no idea what you are suggesting FiL! If I had known there was any connotation to the word "cheeba..."
i love your description of morcheeba's music, btw. compelled me to download it, i tell you! Glad you liked it! It was hard to pick from some great songs.